Maria is one half of the podcast Magic the Amateuring. When she's not working on the podcast, she's probably in an improv show, speaking Welsh, or thinking about popcorn. Rakdos is the true nature of her heart. The leaves are bursting into color on the trees . . . The scent of pumpkin spice swirls through the air . . .
Friends and neighbors are transforming into spooky characters . . . It's a brand-new Brawl format!
. . . What? You thought I was gonna say something else? Fall is in full force on Ravnica and everyone is racing to rep their favorite guild in every Magic format possible. Standard is new and unsolved, Draft is wide open as players scramble to crack the format, and Modern is excitedly dusting off its mantle for a brand-new Assassin's Trophy. What, then, can we expect from Brawl? Brawl might be the baby of Magic formats, but it has tons to offer with an infusion of super interesting brews featuring cards from Guilds of Ravnica. If you're the kind of person who rushed to the Prerelease to make 100% certain you'd get a copy of your guild kit, why not try playing a sweet Brawl deck based on your color pair? Today, we're going to look at new Brawl builds from the five guilds of our most recent set. Let's keep with our Halloween theme and start out with the spookiest 60 of the bunch. First of all, using Etrata as your commander is just plain badass. She gives you a really cool alternate win condition and takes . . . "care" . . . of your opponents' creatures at the same time. Plus, you don't have to shuffle her back into your library as soon as she takes a hit out. She just heads on back to the command zone and chills while you get ready to give her another dark assignment. I feel like the Godfather. This deck is great for control mages, chock full of everything you could possibly want. 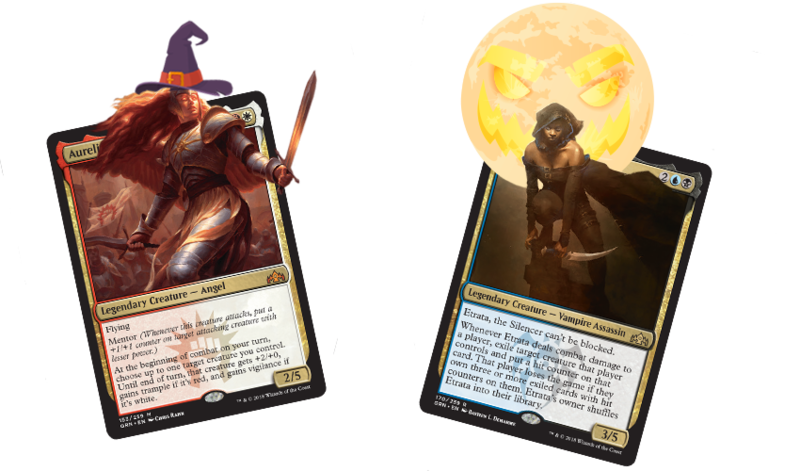 From excellent card draw like Chemister's Insight and Arguel's Blood Fast to sweepers like Vona's Hunger and Golden Demise and kill spells like Murder and Ravenous Chupacabra—this list is ready to make your opponent think they're winning the game . . . and then completely take it over. Silly opponent. So much hope, so easily destroyed. Other win conditions tucked inside it come in the forms of Nezahal, Primal Tide; Demonlord Belzenlok; and everyone's favorite Sphinx with a creepy beard for a face: Dream Eater. Yass, queen! Vraska is here and she's creepier (and more elegantly mushroomed) than ever. If you don't mind getting a little dirt under your nails while you sacrifice your friends for profit, Vraska just might be the commander for you. She does it all: gains you life and draws you cards, destroys your opponent's cheap threats, and ultimately makes your attacks deadlier than ever. This list is synergy-tastic with lots of ways to stock your graveyard full of creatures while reaping the benefits of doing so. Stitcher's Supplier was recently the new hotness in Modern, and has interesting applications in current Standard formats (like Brawl, hint, hint). In this deck, it does everything you could want. It's a cheap creature that comes down early and fills your yard. It's also A+ fodder for Vraska herself later on. Kill spells like Find // Finality clear up the board leaving you with a giant creature and tons of fuel for undergrowth that you'll put to excellent use with cards like Necrotic Wound or Izoni, Thousand-Eyed. Rhizome Lurcher is another payoff for a giant graveyard, as are Golgari Findbroker (an all-around awesome card) and Lotleth Giant, which can kill out of nowhere. Of course, Vraska wouldn't be complete without her Contempt or her good friend (and enemy of fliers everywhere) Vivien Reid. Also, if you don't know the joy of powering out a Molderhulk early, you haven't lived, my friend.
. . . Or, lived and then died, and then been reanimated again? I don't know, the Golgari are weird. And now for a deck after my own heart—one that features Aurelia, Exemplar of Justice. I've been playing with this card almost non-stop in Standard, so a Brawl deck build around it is everything I want in life (minus some new fleece leggings, a wise, bearded wizard as my best friend, and world peace. I'd also just take the leggings). Aurelia is a pure bomb, providing advantage in every quadrant of gameplay (development, at parity, when you're losing, when you're winning), is a low-cost flier, and teaches your smaller creatures to be better than they are. This list is 100% pure, unfiltered Boros and excels at using its new Guilds of Ravnica mechanic: mentor. Carrying the banner for the Legion we have all the hits: Swiftblade Vindicator; Tajic, Legion's Edge; and the clumsy hardware store employee himself, Hammer Dropper. Heroic Reinforcements race in to provide the support you need, and Healer's Hawk, while initially underwhelming, represents a fantastic mentor target and an evasive early threat. The Boros love nothing more than a good combat step, so this list packs some sweet tricks as well as its sword. Response // Resurgence helps your Soldiers in combat and provides another combat entirely for any battle-ready recruits left fighting. The ultra-cheap and recursive Maximize Velocity can leave an unprepared opponent deader than last season's breastplate. with all your creatures at once, this deck could be true love. What if you're more of a peaceful person? Someone who likes to make new friends, play the ukulele on a beach, or circle Arbor Day on your calendar with a heart? Or maybe you just like to swarm the board with creatures and overwhelm your opponent into fatal oblivion? Either way, you're gonna love a deck with Trostani Discordant. This list plays out lots of small creatures early, like Pelt Collector, Bounty Agent, and Ledev Champion. They'll be able to chip in for some damage themselves, but once you're in the Conclave, you have a bigger purpose. Cards like Worldsoul Colossus, Venerated Loxodon, and March of the Multitudes use convoke to power out devastating effects that can immediately put your opponent on the back foot. Trostani helps with the cause, of course. As soon as you play it, you're rewarded with two lifelinking 1/1s (hello, convoke!) and a +1/+1 buff to all your creatures on the board. As a bonus, if anyone's tried to mind-control your dudes with cards like Hostage Taker or Connive, you'll get them back at your end step. This deck is packed with creatures that play very nicely together, as is Selesnya's way. Inspiring Unicorn provides a power and toughness buff when you attack, Dawn of Hope doles out a stream of 1/1s, as does Emmara, Soul of the Accord. Lena, Selfless Champion gives you an insurance policy against board sweepers, and cards like Beast Whisperer and Mentor of the Meek keep the card draw engine chugging along if you find yourself a bit out of gas in the mid to late game. If you find yourself in dire straits, don't worry, you're also sleeving up Citywide Bust and Cleansing Nova. Ah yes, there's that peaceful feeling again. Namaste. I've saved the most crazy dangerous nutty inventive clan for last. It's the Izzet! And who better to lead their charge (get it? Charge? Because they like messing with electricity? . . . never mind) than the big daddy Dragon himself, Niv-Mizzet?! If you like to solve puzzles while you play, then this is the list for you! Every turn provides a new opportunity to construct an inventive win by assembling different pieces of your deck. Or, you could just play Niv-Mizzet, Parun unanswered and win the game easily. It's your choice! I love Izzet in Guilds of Ravnica Draft because it relies so heavily on going into the tank and really thinking about your turn. Lots of times you'll be able to ramshackle together a win while your opponent is still at a relatively healthy life total. You really do feel like a mad inventor on Ravnica! This deck helps replicate that feeling using tricky creatures like Piston-Fist Cyclops and Wee Dragonauts to string together lots of damage, and spells to turn them on like Direct Current and Hypothesizzle. Arclight Phoenix pays you back in a big way for casting multiple spells a turn, while League Guildmage copies those spells and Expansion // Explosion kills your opponent in some kind of man-made lightning storm that's definitely not up to code. There's even a spicy Dragon sub-theme in this deck with Sarkhan, Fireblood; Lathliss, Dragon Queen; and Dragon's Hoard. Because, you know, why not? Use your brains to build an incredible victory! Or at least a spectacular defeat. That's how the Izzet would want it. So get out there and Brawl! Represent your guild proudly! Brawl is an excellent way to get more value out of cards you drafted or played in Sealed that aren't headed into your Standard deck. It's also tons of fun and has room for myriad new decks. Oh! And if you dress up as Niv-Mizzet for Halloween, please tweet me a photo @MissMariapants. I need to see that.